As catering manager Kristina Viator was leaving Tempe Center for the Arts a few Saturday nights ago she noticed the crowds at Tempe Town Lake. She realized people were there playing Pokemon GO (Phoenix New Times recently reported Tempe Beach Park as one of the best places to play Pokemon GO). It occurred to her that some good could come from the popular game if she simply asked people to bring a can of food as they hunted around the lake. Viator intercepted a few of the players and they confirmed it would be easy to show up with a can of food and that was all she needed to hear. 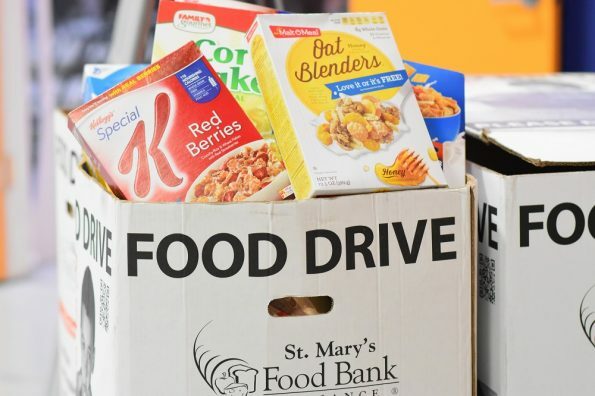 Viator contacted St. Mary’s Food Bank and discovered that they are low on canned fruit and cereal for emergency food boxes. The Tempe Center for the Arts agreed happily to be the designated drop off point. Viator’s employer Fabulous Food Fine Catering and Events then provided her with the resources for her initial drive that will be held August 6th. So here is where you come in! You can bring these much needed items to the Tempe Center for the Arts on August 6th from 4-10 pm! All donations will go to St. Mary’s Food Bank to be used in their emergency food boxes. The Tempe Center for the Arts (TCA) is one of the finest venues in Arizona – a jewel in the crown of a city known for its support of the arts. Plenty of parking is available to serve the center, which is just an .83-mile walk from the Mill Avenue/Third Street Metro Light Rail stop. The TCA is located on the southwest end of Tempe Town Lake. Fabulous Food Catering and Events is a custom, high-end catering company offering distinctive event planning services. Fabulous Food is owned and operated by husband and wife, Alan ‘Skip’ and Chantal Hause. The company has been producing one-of-a-kind events with exquisite artisan cuisine since 1996.